At DerbyCon event, Metasploit core developer David Maloney aka “Thelightcosine” presents the ins and outs of making payloads undetected by antivirus software. David: Good morning DerbyCon! That’s a lot of people for 10:00 in the morning, so I am just going to throw this out here. I can do this talk or we can have group nap time. What do you think? David: Alright, alright; really happy to be here. I go to DerbyCon every year. This is my first year speaking here. I am really proud to be here. This talk is “Antivirus Evasion: Lessons Learned”, or my alternate title “1000 Ways not to Make a Lightbulb”, off the famous Thomas Edison quote of course. So get this out of the way real quick on who am I and why do you care what I have to say (see right-hand image). I can at least answer the first one, you will have to answer the second one yourself. 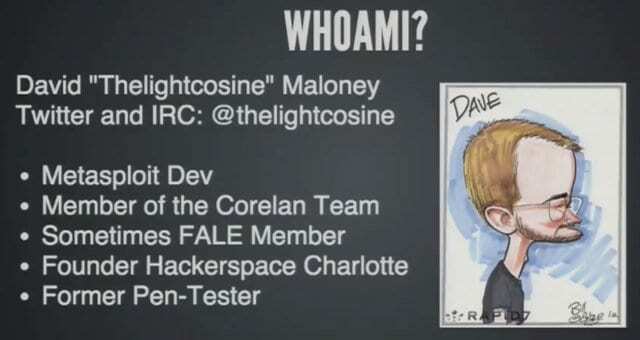 I am David Maloney aka “Thelightcosine” on the Internet. You can find me on twitter and IRC: @TheLightCosine and I am on freenode on the Metasploit channel. I am a Metasploit core developer. I work on both Metasploit Framework and the commercial products. I am a member of the Corelan Team, which is my distinct privilege and honour. I am a sometimes member of the FALE Association of Locksport Enthusiasts. Any of my FALE guys in here? No? Oh, that’s sad… I am one of the founders of Hackerspace Charlotte and a former pen-tester; yes, former pen-tester. I took an arrow to the knee. I think that is a really important thing for the InfoSec industry and community. If you are not pushing yourself to do new things, things that make you a little scared that you are going to fail, then you are doing it wrong. You’ve got to keep challenging yourself to do new things. The process for learning new things, in my mind, is first you learn it. So you get somebody to help you learn, you read up on the subject, you find all the information you can, you internalize it. Then you do it, you practice it over and over and over again till it really starts to sink in, but you still don’t actually know it yet. When you finally know it is when you start teaching it to other people. And that is really important, you have to do all three of these steps to really truly know something, and if you haven’t done all three of these things you’re probably still a noob. You’ve got to keep challenging yourself to do new things. Let’s move on. Why are we talking about AV Evasion? If you are a pen-tester, this has probably happened to you at some point. You have gotten a shell, your exploit worked and then 20 seconds, 30 seconds, a minute later something happens and your shell dies. Chances are it was the antivirus that caught your payload on the system and nuked it. Now, where this tends to be a problem is when we have to touch the file system. When we have a straight up memory corruption exploit, our payloads tend not to get detected. You can upload that payload to any AV vendor you want and you can see the detections, but when we are just inserting it right into memory AV is terrible at finding it. We haven’t put a lot of effort into AV evasion in the past, partially because Metasploit and exploitation in general were very focussed on memory corruption exploits, but the exploitation landscape is changing a lot lately. Where we are getting caught most of the time is when we are writing to disk. This is things like using PsExec, I hope most people have at least a familiarity with using that module. Any command injection, exploits, anything that is going to write that payload to disk and then use some sort of method to execute it from disk – that’s where we are really running into our problems. A lot of the exploits and attacks that we are seeing now require that. Memory corruption is not dying completely but it is becoming less and less common to run into. How do we get around this problem? Well, Metasploit has a series of its own unique challenges when talking about payloads. Number one is that we are a high profile target. One of the reasons Metasploit gets flagged all the time right now is because all of our executables have been downloaded by all of the vendors and they write a signature for it. You can take the default executable template for Metasploit payloads and check it on VirusTotal. There is maybe one vendor that isn’t flagging it even without a payload in it. The next challenge is it must be redistributable. There can’t be any licensing requirements, it has to fit with our licensing scheme. It has to be something that works within our code base and within our Framework, and it has to make sense to deploy on a large scale. Lesson 1 is don’t stand up, right? We just said: “If you don’t touch the file system you are not going to get caught,” so avoid touching the file system if you can, and I am just getting this out of the way. Memory corruption exploits are always a better way to go if AV is a concern, and if it’s not there are a lot of other tricks out there. The most prominent and successful one lately is the use of PowerShell, and I am not going to go too in-depth in that because there are a lot of smarter people doing a lot of cooler stuff with PowerShell than me. You can check out the PowerSploit guys, Carlos Perez did a training class at the beginning of DerbyCon, but PowerShell gives us a lot of opportunity to execute code without ever writing anything to disk. Can’t do without touching the file system? If you absolutely must touch the file system – don’t panic, don’t hide, blend in. That is going to be kind of the theme for this whole talk (see left-hand image). A lot of people, when they do antivirus evasion, are trying to hide, and what they really need to be doing is blending in. A lot of people use obfuscators, encoders, encrypter packs. It gets them good results, at least at first, and this is what they think they look like (see leftmost image to the right). Here is what they really look like (right-hand part). Yes, it is going to work for a little while but pretty soon you are going to get spotted and then you are right back to where you were.